I just need to comment that I really like this app & could not be happier about the thorough answers to help requests. Thanks! Is there a setting that I changed to make this happen — can it be fixed? Hi Paul, thanks so much for your feedback and your question. Kindly note that adding item to a sublist will show that item on Master list and vice versa. 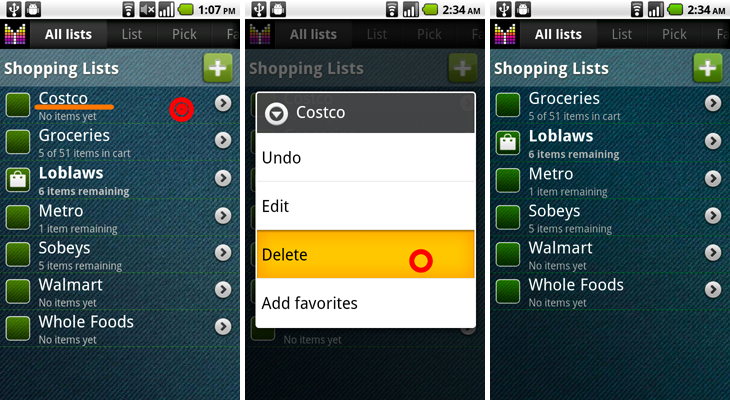 Perhaps it will be possible later, when we allow assigning an item to multiple shopping lists. Thanks — it’s probably best to keep it simple anyway! Is it possible to have items entered specifically into a Master List come FIRST — before, that is, items that have been entered into one of the sublists? 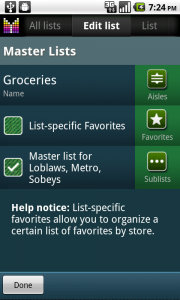 As it is, when I pull up the Groceries master list, the items are listed in alphabetical order of the lists. So Costco items appear before Groceries items. Paul, unfortunately, Mighty Grocery lists all items alphabetically grouped by sublists in a Master list. We may consider changing sort order in the future. This is probably a dumb question, but what does the shopping bag icon mean (shown next to ‘Groceries’ in the screen shot at the top)? Sonnenblume, the bag next to a shopping list means that this is the current shopping list. 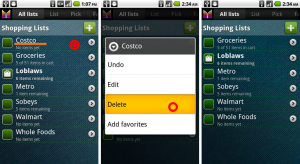 If you switch to the List tab, items from the current list will be displayed. 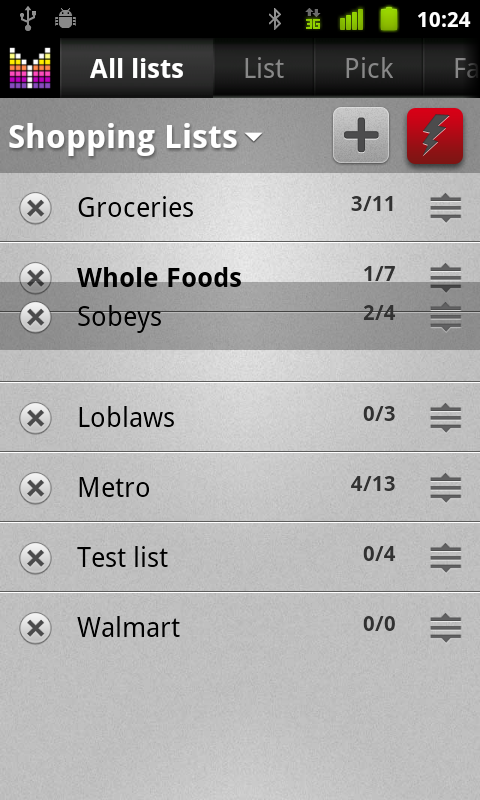 I assumed this app would have the function of making a master list of groceries you usually buy, then being able to check off items you need for a shopping trip and moving those items to another list. I cannot find this function. Is it available? Judith, thanks for your question. Yes, Favorites tab keeps items that you usually buy. Once you create your Favorites list, adding an item to a shopping list is as easy as a single click. You may also be interested in List-specific favorites feature. I’m hoping you can address this problem. As you may be aware, there are two types of Walmart stores, the old-style general merchandise stores and the new (used to be rural only) super stores (which also sell groceries). The Walmart closest to me is of the general merchandise variety. I have set up a master list called “Walmart Super” which has two subs, “Walmart Foods” and “Walmart General Merchandise”. What I do is put all non-grocery items on the general merchandise list and all foods on the the food list. That way if I’m at the the non-food store I can use the general merchandise list for shopping. If at the superstore I can use the Walmart Super master list for both my food and general merchandise needs. This works very well for me, but with one problem. If I am checking out at the superstore, using the master list, I see the correct total amount at the bottom of the screen next to the checkout button, regardless of which sub-list the item was actually entered on, which is exactly what I want. However, when I actually long-tap the checkout button the totals shown for confirmation zero (unless an item was actually entered in the master list, in which case only that item’s amount is shown). As our super stores use the same checkout lanes for all merchandise, including groceries, it is impossible to come up with a total in Mighty Grocery to check against the total displayed on the store cash register. Is there a solution? Bill, thanks so much for your detailed description of the issue. There is a tiny bug in the app which is scheduled to be resolved soon. I purchased Mighty Grocery and am having great difficulty using it. For instance: I assigned Groceries as the Master List – when assigning sublists, not all my lists (stores) appear in the drop down. Second: My favorites are appearing in the wrong list (that is, wrong store) – how do I move them without having to delete and re-enter? Hi Elissa, thank you for your question. Kindly note that a list won’t appear in sub-lists drop-down if it has “Master list” setting ON. Please make sure to turn OFF the “Master list” setting for all the stores you’d like to see as sublists. Unfortunately, there is no easy way to move items between favorites list. However, please make sure that “List-specific favorites” option is ON for the lists which need their own set of favorites. If this option is OFF, the list will use a default Favorites list. Have you ever given any thought to have comments that are inserted into items on the shopping list not show up in the favorites? Sometimes I add a brand name that is on sale to an item in my shopping list but then it shows up on that item in the favorites and remains there until i edit it out. Kindly note that if you don’t want your comment to be copied to Favorites, you could unlink your items by clicking the button in the upper-left corner under Edit item tab. Please see Linked and Isolated changes section in User’s Guide. Thanks Alex. So simple yet I overlooked it! 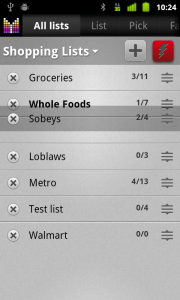 I really would like to be able to group my master shopping list by aisle, not (only) by sublists. Is that possible? E.g. : If I go to a big supermarket which has all the groceries I usally buy in several shops and select my master list groceries I can not have the items grouped by aisle which makes it more complicated to walk through the market. Shifting all items to a separate sublist before shopping does not seem to be very convenient either. THANKS! 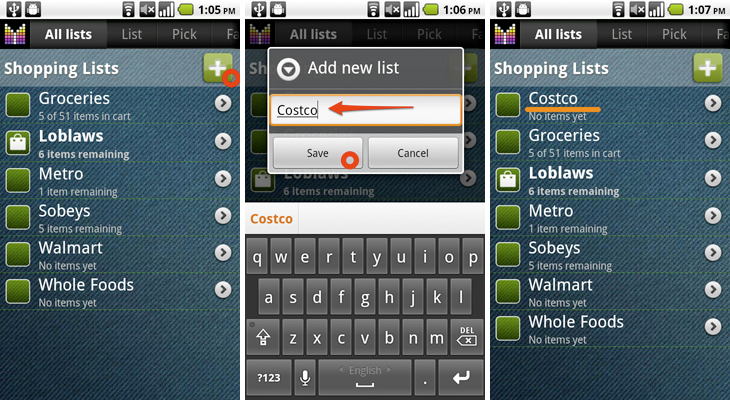 Unfortunately, grouping master list items by aisles is not possible in Mighty Grocery. Given that all stores have different layouts, it’s unclear which aisle configuration should be used to group items under master list. Have been a successful, happy user for several months. However, have run into a problem with a specific product, (Bacon) I can’t correct. I have entered “Bacon” as an product on my Groceries List screen with it’s Aisle set to “085-Bacon & Sausage”. I can purchase Bacon and it shows up on History but will not go into the Pick List under “085-Bacon & Sausage” (or anywhere else in my Pick List). 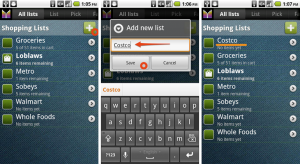 The option is set to add products from Lists and History into Pick Lists. Several other items show up in “085-Bacon and Sausage” on my Pick List, just not Bacon! I can successfully add new items and they subsequently show up on the desired Aisle in my Pick List. Bacon shows up when I do a search, it’s Aisle is correct and its Shopping List is set to Groceries (like all the other items that do work properly). How can I get Bacon to work like the all the other Items? Could you please check if the following option is ON for “Bacon”? Under Edit item tab, scroll down and check the option “Show in Pick list and Search”. It should be ON in order to be displayed under Pick list. Can I change the order of the ailes in my stores? Hi Grace, thanks for your question. Yes, it is possible to change aisle order in Mighty Grocery. Please see Manage aisles User’s Guide for more details.